Being the youngest member of a quaternion of archivists nominated to the Czechoslovak state arms inquiry in December 1918 Václav Vojtíšek (1883-1974) seemed not to be too very active when a design of the Czechoslovak flag was discussed at the commission attached to the Council of Ministers. After finishing his studies of history, philosophy and auxiliary historical sciences at the Czech University in Prague in 1911 Vojtíšek was engaged as an adjunct to the Municipal archivist of Prague. Due to his low age or activity in the commission he was not nominated to the flag sub-committee in January 1920, but he commented its results very often. Vojtíšek opposed the use of a blue triangle on the Czechoslovak flag that "savoured of an unnatural and strange impression ", according to him. However, when he could change the Czechoslovak flag in accordance with his taste almost twenty years later he was not successful again. His proposal to replace "an inappropriate" model from 1920 by a new one combining Bohemian (W+R) and Ruthenian (B+Y) colours in the vertical arrangement could not be realized due to the missing Constitution that would reflect a new organization of the post-Munich republic and other political problems; his vexillological proposal was put aside. It seems that V. Vojtíšek - as a director of the Prague Municipal Museum (from 1920) and a full professor of auxiliary historical sciences (from 1935) - also affected symbols of the Protectorate of Bohemia and Moravia and deserved to their national character. 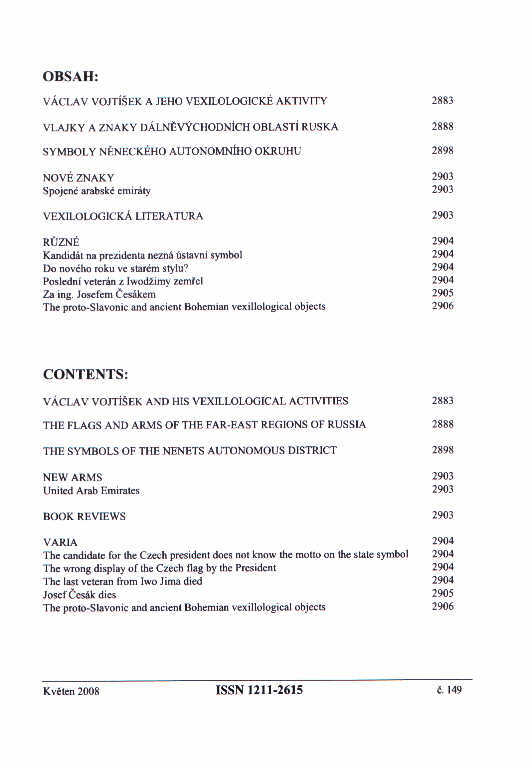 Thirty years later Academician V. Vojtíšek supported the experts' opinion when the Czech Republic chose its own flag in 1969 - a historical Czech flag in white and red. 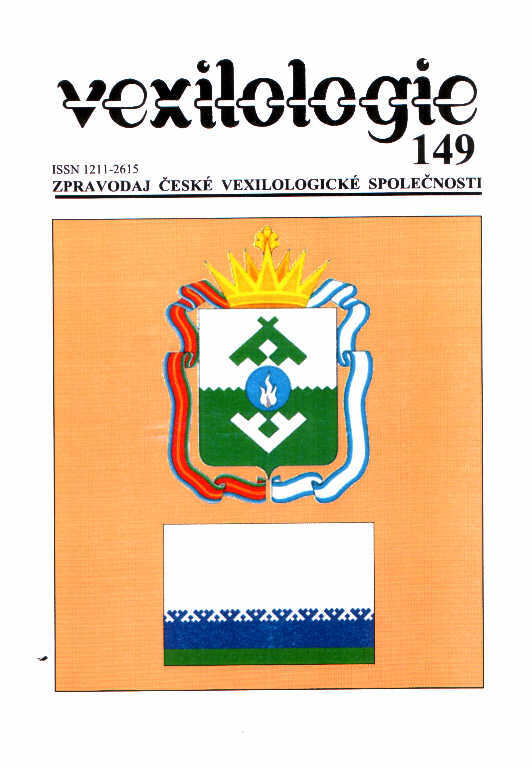 However, from the vexillological point of view the greatest contribution of V. Vojtíšek was his lifelong research on municipal flags and his often appeal to the citizens to hoist them and to pay respect to them. He wrote many articles on that matter between 1921 and 1952. Local peculiarities found nowhere else in Russia but here - volcanoes - are reflected in the arms (Fig. 3) and flag (Fig. 4) of the Kamchatka province, blue wavy stripes of which stand for sea and Pacific Ocean surrounding the peninsula and grandeur whilst white colour reminds of peacefableness, purity, virtue and magnanimity of Russia. In the Soviet style designed arms (Fig. 7) have been adopted by the local authorities of the Magadan region in 2001. Three metal ingots and geological tools symbolize mining industry, hydropower station stands for energy, aircraft for transportation and three silver fish with golden scales for fishing industry - the main branches of local business. Red, blue and white colours of the regional flag (Fig. 8) are those of the Russians, wavy stripes recall the Okhotskoe Sea. Many symbols of the ancient Cossacks are incorporated into the arms of the Rostov region (Fig. 12) - except of a red fortress over a blue wavy stripe standing for the Don River and a golden ear (blue, yellow and red are traditional colours of local people) those objects are regalia granted by tsar Peter the Great and tsarina Elizabeth to the Great Army of Don Cossacks in the past. The most favourite colours of them are set up into the tricolour of the Rostov regional flag (Fig. 13). Tradition of the armament industry is reflected in the symbols of both town and region of Tula in Central Russia - three silver blades crossed in saltire and accompanied by two golden hammers are shown in a red field of both arms and flag (Fig. 19, Fig. 20). Referring to the previous information on the flag of this territory the author Petr Exner depicts symbols of the Nenets autonomous district of Russia adopted in 2003 and 2007, respectively. However, municipal symbolism of the district´s capital of Nar´yan-Mar is of an earlier date. Both the original design of the arms from 1987 (Fig. 1). and its modification from 2001 (Fig. 2) have to symbolize a prevailing occupation of local people - breeding of reindeers and fisheries whilst a drilling derrick in the former stood for a new industry - geology. A previous division of the shield in fess (B-, B+) referred to sky and sea (silver figures stood for snow) was replaced by a red-blue one in 2001. The municipal flag (Fig. 3) was modeled in the same sense. Regional arms were originally adopted in the 1970s and used officially until 1999 - a blue disc was charged with a silver head of reindeer turned to the left and with five four-pointed stars (Fig. 4). A silver inscription around reads a Russian name ofthe district. The 70th anniversary of the district's foundation in 1929 was celebrated with a new version of the arms (Fig. 5) that remained an occasional jubilee symbol only. In 2002, a new model of the arms (Fig. 6) was presented by the district administration but refused by the legislature. A silver head of reindeer had to symbolize nature and natural riches of the district whilst a golden eight-pointed star stood for high aspirations of the population, for Sun, vital power, the North Star and energy of oil and gas; a mining of oil and gas is also referred by a golden flamy coronet. Green colour of the shield recalled youth, hope and vital power, silver symbolized both the nobility and purity, gold stood for abundance. The similar signification pertains to the regional flag (Fig.7) adopted by the deputies on 25 October 2003 already – blue colour symbolizes stability and infinity. A definitive version of the arms (Fig. 8) was adopted on 4 October 2007 - three colours of the arms have to express a harmony of three elements – skies (W), land (V) and water (B-). White is also reminder of nobleness of the kin, frankness, and sincerity; it stands for the North, purity, heartiness and snow, as well. Green refers to tundra in summer, to hope, abundance and freedom. A light blue colour reflects the river of Pechora connecting the worlds of both contemporary inhabitants and their ancestors. Local symbols for protection (above) , reindeers (below) and hearth (in the middle) are used as a charge of the shield.